Howdy. I mentioned earlier being a writer, and so before I get to writing original pieces for The Fastlane, I’d like to share some of what I’ve written. I’m from the United States (New Jersey to be exact), so most of what I write will be about stock cars. HUGE THANKS TO THE SOCIAL MEDIA TEAM AT BERLIN RACEWAY AND TO JEFF WAGONER FOR INFORMATION PERTAINING TO SCOTT MITCHELL BAKER! YOU GUYS ARE AMAZING! Like all sports, motorsports has its gentlemen and its not-so-much’s, its ladies and its unrefined, its kind competitors and its rude individuals, its unphased and its angry, its mature and its childish. Even the most passionate and gentle of racers are prone to slipping up. While true sportsmanship is not frequently seen in racing, it does most certainly exist. Case and point, a man possessing a sense of charisma so strong that his local speedway named their sportsmanship award for him, Scott Mitchell Baker. Scott Mitchell Baker was born on April 30th, 1957 in Chicago, into a family that would eventually have seven children. His father was Ralph Baker, a successful Midwestern racer. Scott graduated from Saugatuck High School in Michigan in 1975 and served in the U.S. Navy for six years before heading back and settling down in Holland, Michigan, where he would stay. He started racing in 1982 and eventually met a lady by the name of Julie. The pair wed and had two children, daughter Brandy and son Scott II. Baker quickly found local success, mostly at the Berlin Raceway. Berlin is very famous for its bizarre shape and lack of a backstretch wall, and is one of the trickiest short tracks in the country, so this was a feat in and of itself. Baker did race at other tracks besides Berlin, however. He quite famously flew out of the track at Winchester during a late model race in 1986, though he was unhurt. 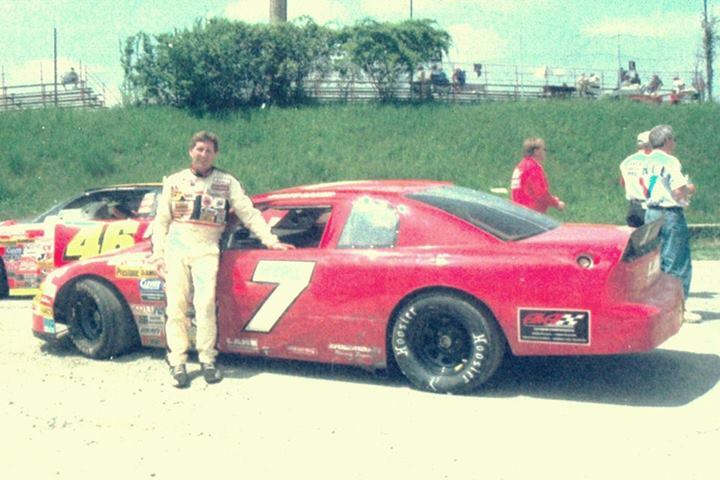 In 1995, Baker won 5 ARCA late model races at Berlin Raceway, something he was extremely proud of, but didn’t flaunt. Scott moved up to ARCA in 1997 and ran occasional races whenever the series raced near his home. He made his first start at a late season race at Salem. The #7 self-sponsored car came home midfield. Scott ran one more ARCA race in 1997, four in 1998, and in 1999 he ran five. He finished fifth twice, at Winchester in 1997 and the same track in 1998. After ARCA started in 1953, Berlin was a semi-regular stop on the schedule, holding races every now and again. In between 1969 and 1998, however, they only ran a race at Berlin once (1986). Berlin was included again on the schedule in 1999, and Baker jumped at the opportunity to run his home track. The popular local sat on the pole, led 50 of the 200 laps, and finished in eighth. Baker was respected both on and off the track for his skill as a metal fabricator, and during the week he used those skills in a metal fabricating business that he ran, Baker Metal Products. Baker was passionate about his business, and always welcomed customers with a charismatic greeting and a smile. Baker’s driving style was incredible. He frequently bobbed and weaved for position, trying the outside in one corner, slowing up if it didn’t work, finding the apex for the next corner, and getting a good run on its inside, then either trying again or reversing the process the next lap. It was an aggressive driving style, but one that relied less on getting into other drivers and more on striking when the iron was hot, so to speak. If drivers saw Baker go by them, it was usually because they weren’t paying attention. Baker was going to start his 2000 ARCA season at Salem in the spring, but ended up withdrawing for whatever reason. He made his 12th ARCA start at the Jasper Engines And Transmissions 150 at the half mile Toledo Speedway on June 23rd, 2000, running the #71 car for Arne Henriksen. He started well and ran up front for most of the day, eventually finding himself in eighth. On lap 146/150, owner-driver Joe Cooksey, who a year and a half before had made headlines by hitting the pace car at Daytona, looked for a lane on the inside coming off of turn four and gave a slight bump to Baker, sending Baker across Cooksey’s nose and to the inside of the circuit. Toledo Speedway contains a 1/5th mile short oval on its frontstretch, and during ARCA events, the short oval was used as the pit lane. 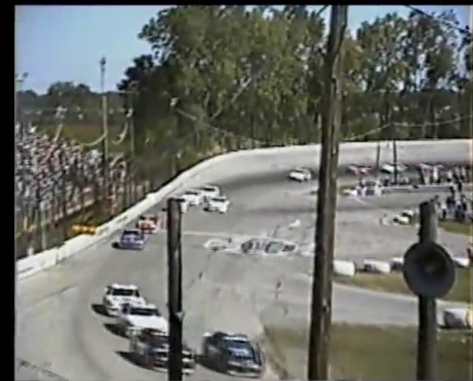 For this event, ARCA had the Toledo Speedway set up a tire wall to protect the pit crew. Baker struck two earth mover tires with his passenger door at about 120mph, sending the tires, both of which weighed hundreds of pounds, flying into the pit lane and forcing everyone to scatter about. One of the tires struck and severely damaged a team’s pit box, but no one in the pit lane was hurt. The hit itself had been one of the most violent ever seen on a short track, with the Monte Carlo decelerating on the spot and almost flipping over from the impact. 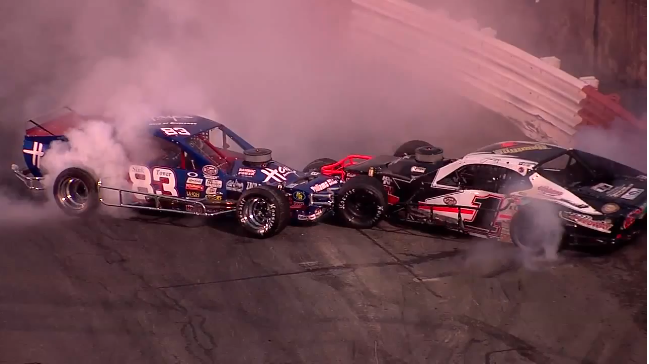 The race was red flagged while safety crews extricated Baker, and with so few laps left, officials decided that there was no need to continue the race with a driver in need of such urgent medical care. The race was ended a few laps early, with Frank Kimmel being declared the winner. 43-year-old Scott Mitchell Baker was pronounced dead just after arrival to the hospital, which was shortly thereafter relayed to the drivers. Scott’s harness worked fine and his helmet was undamaged. Scott even used a neck brace, an optional piece of equipment at the time, and that did its job. Officially, Scott was killed by the lateral deceleration of the impact, which severely damaged vital arteries in his brain. The media was rather timely with Scott’s passing, ARCA and the Toledo Speedway both responded to his death with the proper condolences, and the Jasper Engines And Transmissions 150 was shown on tape delay some time later with a message at the end of the race that Baker had passed. Toledo stopped using the short track as the pit area after the crash and built a proper pit lane. Oddly, one of Toledo’s most popular local drivers is also named Scott Baker. The Ohioan Scott Baker, who won the Iceman Championship in 1999, is even around the same age as his fallen Michigan counterpart. The Ohioan Scott Baker is mostly retired as of 2017, running the select event here and there and managing a race car parts supply store. ARCA stopped by Berlin a few weeks later, and Tim Steele won the race. Tim immediately donated all of his earnings that night to the family of Scott Mitchell Baker in a tribute to Scott’s sportsmanship, and the Berlin Raceway has since named their sportsmanship award for Scott. Ralph Baker, who was part of Scott’s pit crew on June 23rd, 2000, is still a somewhat frequent face at the Berlin Raceway despite pushing 90, and Julie Baker took over Baker Metal Parts, still running it to this day. Berlin Raceway lost its ARCA date after 2016, but the oddly-shaped 0.4375 mile oval in the Grand Rapids suburb of Marne, Michigan will host a NASCAR K&N East Series race in 2017. Scott Mitchell Baker’s sportsmanship was admirable, and his driving style reflected his kindness. Hopefully the drivers who faced off against him were able to realize that fair and clean racing, not rough driving, is what earns a driver respect, and they were able to adjust their driving styles accordingly. I'm a young writer out of New Jersey. Not much more to say.